Husband, Father, President of the HRCR, President of the BRDC, The Fifth Beatle, The Mini Legend, Member of the Most Excellent Order of the British Empire… Paddy Hopkirk has had a lot of titles but his most recent accolade celebrates a lifetime of achievement and a continuous dedication to motoring, education and cultural inclusion – and here at Mini Sport, we could not be happier to call Paddy Hopkirk our friend. Outside of his motorsport achievements, Paddy became a successful businessman founding Hopkirks Ltd, a premier brand that primarily focuses on the manufacture of automotive accessories and components. Following Paddy’s success as a world-class businessman, he established the charity organisation Skidz with the objective to offer motor education and provide training and employment opportunities for young people around the High Wycombe region. Skidz, as a vocational training provider has since grown to encompass a broader range of further education courses and in it’s time as an independently funded project has helped more than 8,000 young people earn valuable motor skills, find employment and ultimately build self-esteem since it’s launch in 1998. Paddy has also been involved with the Integrated Education Fund (IEF), which seeks to bridge the gap between traditional divides in Northern Ireland with inclusive, independent schools, which build respect and friendship for young children from all religious and cultural backgrounds and has also been made a patron for the disability charity WheelPower, which works to deliver a bright future for Wheelchair sport and the Paralympic Games. As we enter 2016, we’re overjoyed to hear that Paddy Hopkirk’s achievements in motoring and education will be celebrated and awarded as he finally makes the Queen’s New Year Honour list for his valued services to motoring and young people. As an iconic star in motorsport, a maintained patron of historic rallying and a dedicated campaigner and supporter for driver safety, education and opportunities for young people, we at Mini Sport are proud to know Paddy so well with his passion, success and commitment followed and supported by Mini Sport since his Mini journey began. Today Paddy continues to attend events with the Mini Sportteam, features on television shows, visits our showroom and workshops and collaborates with our engineers on his exclusive brand ‘Paddy Hopkirk Mini’. With a sentiment that echoes Mini Sport’s ethos, Paddy’s commitment to the Classic Mini community has never dulled and more than 50 years after his Monte Carlo victory, he continues to put the Mini Sport maintained 33EJB replica through it’s paces on the rally & racetrack with the same level of enthusiasm as his BMC debut. Speaking of the news of his MBE, Paddy remained his humble self, telling the press “First of all I’m not sure what it is exactly for. I’m just very honoured and I appreciate the people who have written in. I was very, very surprised… I’m very honoured and flattered and thrilled, of course I am. 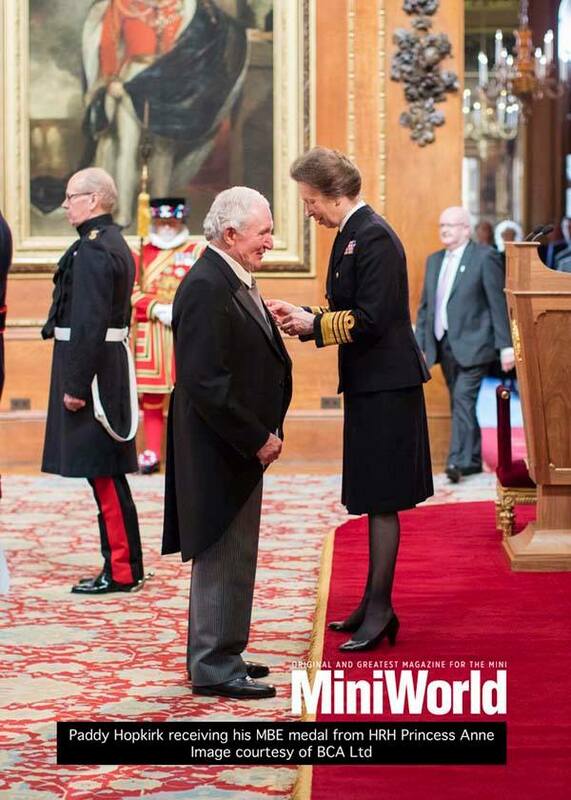 It’s a nice New Year’s eve present.” We couldn’t be happier for Paddy and can’t wait until he officially receives his MBE and becomes identified as Patrick Hopkirk MBE – although to the team at Mini Sport, he will always remain our modest friend Paddy, a kind and caring gentleman with a fantastic sense of humour! A well deserved MBE for an idol of so many generations. If you would like to help further support Paddy Hopkirk’s charitable causes, you can shop signed Paddy Hopkirk Merchandise here, including ‘The Paddy Hopkirk Story – a Dash of the Irish’ with all profits benefiting one of Paddy’s organisations.